Students should meet with a faculty adviser at least once a semester to remain on track for a timely graduation. Faculty advising is available during fall and spring semesters with limited advising during the summer and winter. Students can meet with an adviser prior to entering the University via arrangement with the Design office design@sfsu.edu. To book appointments, navigate to the Faculty Sites and Appointments found in each Professor's page here. Undergraduate students choose their own advisors within their degree area (BSVCD or BSID). See the Professor biographies here. As students become more familiar with the department, they may wish to change their advisor. Students may do on their own without notifying the department office, but should keep their advisors informed of any changes. Until that time, students are welcome -- and encouraged -- to meet with their advisor regularly. All newly admitted students are required to see their advisors during their first semester of attendance. It is recommended that students see their advisors early in that first semester and regularly as they progress to their degrees. Graduate students work first with the department’s Graduate Coordinator, Prof. Hsiao-Yun Chu. As their course of study takes shape, graduate students can meet with advisors throughout the department based on the student’s interests and the professor’s areas of expertise. All advisors are available to students in the M.A. program, particularly for their graduate Culminating Project. 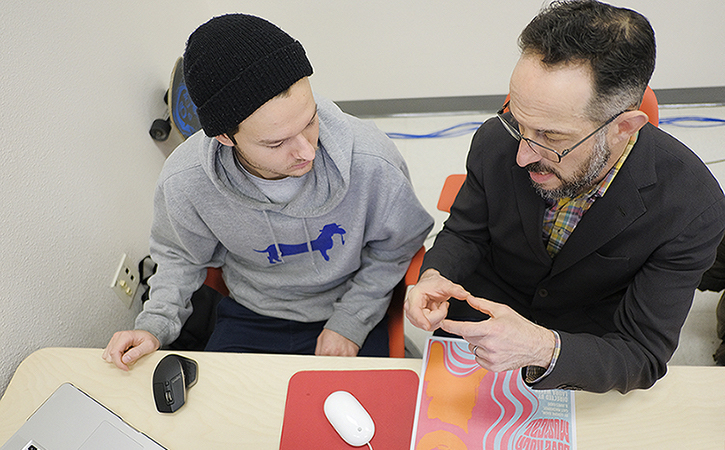 The School of Design recommends that all students work with the the Advising Resource Center (ARC), in SF State’s College of Liberal & Creative Arts. They offer crucial analysis and understanding of GE requirements and general University requirements. The Division of Graduate Studies offers counseling and advising regarding issues ranging from applications to graduation.